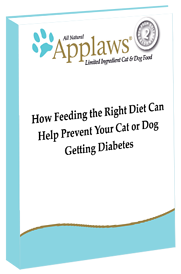 How Can Feeding the Right Diet Help Prevent Your Cat or Dog From Getting Diabetes? What is diabetes and what causes it within cats and dogs? Diabetes can result in the early death of a much loved pet. Download this eBook today and learn helpful ways to prevent this disease from affecting your loved one.